This cute condo has its own direct exterior access and is located within walking distance to all shops, restaurants, and movie theater in town. 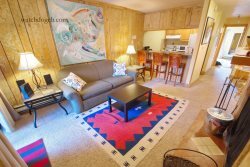 This condo sleeps 4-6 in beds and features recent remodels and cozy furnishings! The living spaces have an open layout with a newer LCD Smart TV to stream all your favorites on Netflix or Amazon. Enjoy meals at the bar height dining table with built in bench and stools. The master is located on the second floor and boasts a king bed. The bathroom is recently upgraded with a slate tile shower. Also off this level is a sunny deck with exterior seating! *The Heartleaf Condo is located directly next door in the same building. Rent both units for larger groups who need privacy but want to be close by. There are two designated, off street parking spaces for this unit. Please note that during the winter season only one parking space is guaranteed due to snow removal. During the winter season, please be sure to abide by the posted Winter Parking Laws to avoid ticketing/towing.